Mail Call: Why don’t they check against the Bible? I receive questions and emails about theological topics from readers, as most bloggers do. My email address is listed in the ‘About This Blog’ tab. Sometimes someone will ask a question in a comment. There’s a comment in the queue in which someone asked me a great question that I haven’t posted yet. I will, I am working on an answer. One particular question I frequently receive is on the topic of discernment. Some people have been given the spiritual gift of discernment. All Christians are supposed to exercise discernment, whether they have the gift or not. (Acts 17:11, 1 Thessalonians 5:21, 1 John 4:1). However, for the edification of the local and global body, as an early warning system, the Spirit has given an extra measure of discernment. The folks possessing this gift can detect false doctrine or a false teacher. People with this gift can detect whether the spirit working in a person is the Holy Spirit or another spirit. They can spot a counterfeit, or detect something off in a person’s life, teaching, or words. And so on. People with this gift see truth so clearly, cling to it so tightly, and react so joyfully, it’s sometimes hard for them to understand how or why everyone can’t see what they see, understand what they know, detect what they detect. it’s perplexing to them. They love the scriptures so much they wonder why any and all Christians don’t leap into truth every chance they get. So the discerning person will gently point out that a certain teacher is false. They’ll share that the teacher is using them as merchandise, or is promoting an ungodly agenda. And the reaction of the hearer will be one of dismissal, apathy, or anger. In most cases, there will be a refusal to even go to scripture and hear out the case. And here comes the mail call question. Q. Are they misinformed (as I once was) because they absolutely rely on misinformation and will not seek to find confirmation for or against a teacher who says questionable things? What this tells us is that, just like today, not everyone checked the scriptures to see if what Paul was telling them was so. Not all people hear and then eagerly check. He said the Bereans were “more” noble, which by virtue of the word more, we understand the Thessalonians were “less” noble. The Bereans were more noble than the Thessalonians because they checked, and the Thessalonians didn’t. The scriptures record that in Thessalonica some did believe, but others (the Jews) were incited by the scriptures and mobbed Paul and forced him out of the city down to Berea. This tells us that not only do some people fail to test scripture but that some hold onto their version of scripture so hard they become varying degrees of enraged when their pet theories or philosophies are exposed. Other times when they refuse to listen to you or to check to see if it is so, it’s because of a situation called ‘deception by investment.’ A believer has followed the false teacher for so long, or invested so much personal worth, (money buying their books, travel time to their conferences, etc) or have staked their own personal credibility in promoting this teacher, that they do not want to face the fact that they might have been wrong all this time. So their pride won’t allow them to check against the Bible and they continue on in their deception. If this is hard to believe, remember, unsaved people suppress the truth very well despite the fact of the existence of the earth telling them every minute that God’s invisible qualities are readily seen. (Romans 1:18-19). For saved people or false converts, it’s the same thing. They suppress the truth that a certain teacher is false. We creatures are good at suppressing. It happens all the time, every day, to the saved and the unsaved. 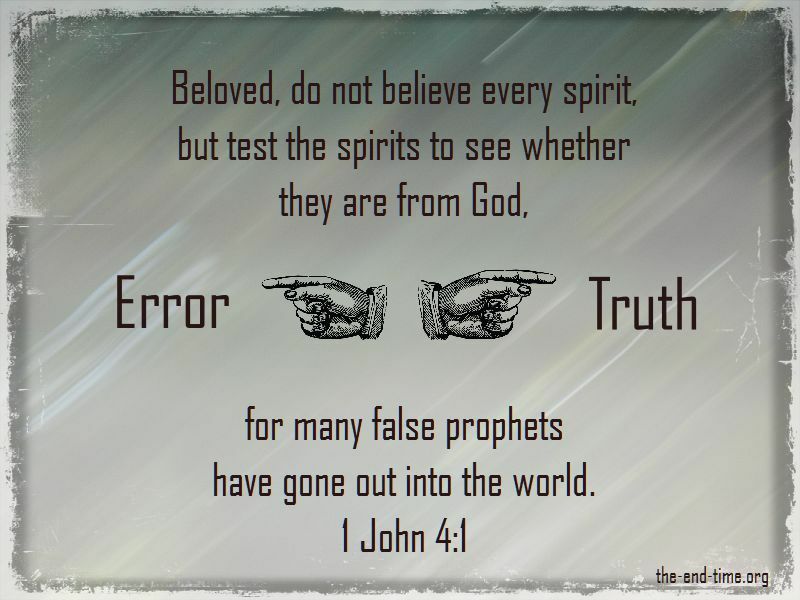 The difference between a false convert refusing to have an ear to hear and the saved person who initially has a bad reaction to the news their favorite teacher is a false one, is the Spirit in them. If the person has the pagan spirit in them, over time they will continue to follow the false teacher. However, the Holy Spirit in a person will never allow them to continue sinning, and following a false teacher is sin. He will alert them by giving them ears to hear, and soon enough, the words you’ve shared will enlighten their mind and begin the transformation by virtue of being carried by the Spirit. The Holy Spirit’s ministry is to point to Jesus, who is Truth. He will not allow a person to continue pointing to the false. So even if you initially receive a bad reaction (hopefully not a mob chasing you out of your town or your church!) if the person is truly saved, they will respond soon enough by repenting and falling away from that false teacher, or false doctrine, or false practice. What is discernment and why is it important?